Air pollution can be defined as dirty air which damages human health, plant and animal life or property. The World Health Organisation defines air pollution as "substances put into the air by the activity of mankind into concentration sufficient to cause harmful effects to health, property, crop yield or to interfere with the enjoyment of property." Air in the UK is cleaner today than in the past when most households used coal fires and factory chimneys belched out black smoke. This is partly due to tougher air pollution laws and widespread use of central heating. 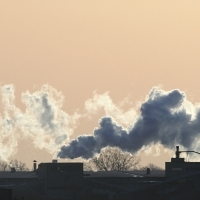 However, recent surveys show that air pollution is still a major concern. Outdoor air pollution (for example from road traffic, air traffic or industry), seems a more pressing problem to most people than indoor air pollution. But in the UK most of us spend more time indoors than outdoors. Indoor air pollution from second-hand tobacco smoke, mould, animal dusts, household products and gases, can be as harmful as outdoor air pollution. The World Health Organisation reported in 2002 that indoor air pollution accounts for "2.7 per cent of the global burden of disease."